Baigan or Brinjal Bhurta !! Take a big brinjal (palm sized or bigger) & pierce it all round with a fork. Massage little oil all over it & BROIL it in the oven by placing it on a big piece of Aluminum foil on top shelf. Keep rotating after every 3-4 min. till its roasted & black on all sides & juices begin to ooze out (about 8-10min approx.). Take it out when done along with the foil, onto a plate & let it cool. Peel off the dry black skin with help of a knife & your fingers without losing the soft insides of the brinjal. Take it in a bowl & mash it nicely with a fork. 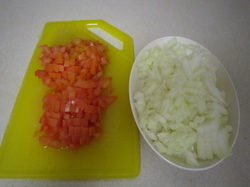 Chop 2 small tomatoes and 1 large onion. Also, if you like spicy...chop 2 green chillies, ginger & coriander leaves. Take it out in a bowl & sprinkle chopped coriander leaves. Decorate with tomato slices, anyway you wish. Serve hot with chapattis or Rotis or Indian breads. 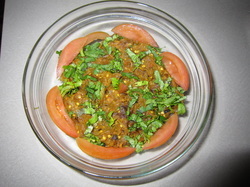 Here is a very tasty Indian home-made dish...goes well with rotis or chapattis or Indian bread. It is roasted or grilled in the oven for great roasted flavor & aroma.